Available as low as $15.99 per oz over spot! 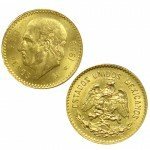 The gold Centenario coin is the most popular historic Mexican gold coin available to modern collectors. 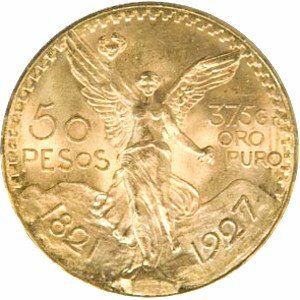 The 50 Peso Gold Mexican Coin debuted in 1921 and was issued regularly as a regularly offered coin for a decade, and later introduced during World War II and the following years as a commemorative coin with the same denominational value. Today, 50 Peso Gold Mexican Coins are available to you online at Silver.com. Coins ship to you in protective plastic! Consists of 1.20565 Troy ounces of actual gold content. The face value of 50 Pesos is fully backed by the Mexican government. 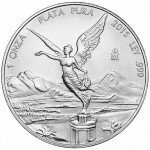 Winged Victory appears on the obverse side of the coin. Mexico’s coat of arms is found on the reverse face of the coin. The gold Centenario was a gold bullion coin issued by the Mexican Mint from 1921 to 1931 and again from 1943 to 1972. The coins were originally issued for a decade to mark the 100th anniversary of the nation’s independence from Spain, but the demand for gold coins during and after World War II prompted the Mexican Mint to revive the Centenario. Gold Centenario coins, or 50 Peso Gold Mexican Coins, were issued again starting in 1943. From 1943 to 1948, the coins had date marks matching their year of issue from the mint. However, from 1949 to 1972 the Mexican Mint issued the coins all with a date mark of “1947” on the coin’s obverse. 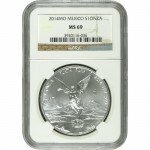 All of the 50 Peso Gold Mexican Coins in this product listing at Silver.com. We offer these gold coins from varied years of issue and in variable condition. Silver.com does not guarantee the date mark or condition of any coin you receive. The particular coin you receive is dependent upon availability when your payment is processed and your coins are chosen for shipment. On the obverse of 50 Peso Gold Mexican Coins is the image of Winged Victory. Based upon the same Goddess of Liberty that America’s Lady Liberty draws inspiration from, Winged Victory is featured in a front-facing depiction with the twin volcanic peaks of Popocatepetl and Iztaccihuatl in the background of the design. The reverse face of these Gold Mexican Coins features the coat of arms for Mexico. The nation has modified and modernized this design over the years, and you could find different versions. All styles look generally the same though, with a golden eagle on a cactus branch as it struggles to defeat a snake in battle. Please don’t hesitate to reach out to Silver.com with questions. You can call us at 888-989-7223, chat with us live online, or simply send us an email.